Here are a number of songs on themes connected to the work of A Living Tradition. All songs written, performed and sung by Peter Sagar. All songs (except Beauty of Northumbria, Ebbs and Flows and Everybody's Waiting) were produced by Frank Kay, who also played keyboards*, bass and lead guitar. Many thanks to Frank for all his excellent work! A song celebrating the Pitmen's Great Stand of 1765, a pivotal moment in the development of Northeast regional consciousness and an identity based upon principles of solidarity, fairness and social justice. A song about the link between the deep coal mining in Northeast England and the coal trade with London. The Cooperative Movement in Northeast England was huge and helped people to develop an alternative society, based on solidarity, fairness and tolerance. In 1873. there were more members of the Cooperative Society per head of population in Northeast England, than in any other region of the country. To find out more about it, please listen to The Steep Road! The Beauty of Northumbria - a song about how beautiful Northeast England is and celebrating life in our region. A song about Burmese pro-democracy leader Aung San Suu Kyi. It was written and recorded when she was still under house arrest. The people of Burma are still waiting for real freedom and democracy. This song was written and recorded in 2005. It now serves as a reminder of what Aung San Suu Ki once stood for. It is not an endorsement of her current policy towards the Rohingyas. This is a song about the experience of Roma in the Holocaust and since then and hopes for them to have a better future in Newcastle and other parts of Northeast England. A song about remembering all those suffering human rights abuses today. was to quietly pin a note to a pit prop, when nobody was looking, to encourage men to join the union. Tyneside was a centre of anti-slave trade and anti-slavery activity in the late 18th and earky 19th centuries. This song celebrates this. In the 1930's Oswald Mosley and the British Union of Fascists hoped they could make the North-east a 'storm centre' of fascist activity. The people of the region had other ideas. No Evidence. There is mounting evidence that asylum seekers returned from the UK to the Democratic Republic of Congo are being imprisoned, raped, tortured and even killed on return. This song documents some of what happens. For more details of this issue go to the Articles page and look for the report Unsafe Return by Catherine Ramos. Rivers Coloured Red explores the plight of child soldiers in the DRC. Cath Higgins is the accordionist and backing singer. Thanks Cath! 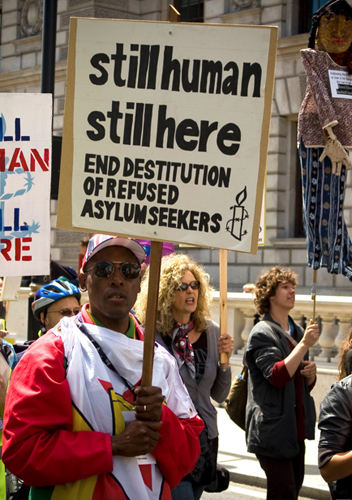 Please also see the campaigns page to see how you can help stop asylum seekers being returned from the UK to torture and death in the DRC. Love Will Blossom - a song inspired by the work A Living Tradition has done with the Roma Community - see the Roma page under the Community heading. When uprisings take place and brutal dictators are swept away they are usually accompanied by much rejoicing. But what of those families who have lost children during the uprising? A song about the yearning for freedom and the fact that we can all play a part by using our freedom to help others to gain theirs. Ring that freedom bell! An uplifting song of hope! A song about three heroes of human rights: Nazi Hunter Simon Wiesenthal, Peter Benenson, the founder of Amnesty International and Dr Cynthia Maung, who established the Mae Tao Clinic on the Thai/Burmese border. It is also a reminder of the difference we all can make. A song about how some new trees get accepted in a forest...or is it really about humans? You decide! When unemployment in Jarrow reached 80% in 1936, 200 men from Jarrow marched to London to ask for a steelworks for the town and a chance to be treated with dignity. All went well until they reached London and the Houses of Parliament. This song reflects on the work of writers who documented the difficult times in North-east England between the First and Second World Wars. The successful integration of communities such as the Irish and the Yemenis into North-east life shows that it can be a hospitable and friendly place to those who are new to the region. Long may that tradition continue. Around the world people sit in prisons for nothing more than the peaceful expression of their views. This song remembers and pays tribute to them. A short instrumental dedicated to the memory of my mother and my brother David. the 'empty' American West in the 19th century. But weren't there people already living there? A song written in response to a comment by the Defence Counsel of the Guildford Four at their appeal in 1989. A song about the life of Jalloh Ibrahim. Please see the online book from the Star and Shadow in the community section for more details. Click on the links below to read stories and poetry about human rights' issues. See also the page on the work at the Millin Centre for details of the publication by A Living Tradition - a book of stories, poems and articles entitled Tales From the Real World. Alexander Wilkie lived from 1850 to 1928 and in 1906 became Scotland's first Labour M.P. Before that, he was secretary of the associated Society of Shipwrights, formed in Glasgow in 1882 from there it moved to Tyneside. Wilkie lived in Heaton and kept his house there even after becoming an M.P. for Dundee. he returned there after standing down form parliament in 1922 and died there on 2nd September 1928. Click on the link to the right to read a short story about the West Papuan human rights activist Filep Karma. This story is inspired by a painting about Filep Karma in the excellent collection of portraits in the Black Portraits by Paul Piercy. Go to http://theblackportraits.org/ for more details. Click below for a short story about the Suffragette martyr Emily Davison. Here is a reflecdtion on the Arab Spring uprisings, written by Barbara Hickman from Kirkbymoorside Amnesty Interntaional Group, after a workshop, led by Peter Sagar of A Living Tradition, in York at the AIUK NE and Yorkshire Regional Conference. Two Letters - a quick reminder that many people are suffering in these hard times and that suffering is suffering is suffering and there is a great need for compassion for all. Everybody's Waiting - a poem about people needing to do things to change their lives and not just wait for things to happen. Janet Makes A Discovery. On a cold Winter's day, Janet finds a destitute asylum seeker - and at the same time discovers herself. There are those who say that Multiculturalism doesn't work - but is that true?